Pasadena's first approach was to focus on installing more conduit and fiber than needed for city services and to lease the asset to a competitive carrier. They allocated $1.8 million from the general fund to pay for network construction. If Pasadena had funded the deployment with electric utility funds, law required the infrastructure be used exclusively for electric utility purposes. The loan from the general fund was predicated on the understanding that funds from a lease to a competitive carrier would first go directly to the general fund to repay the cost of deployment. While the community dedicated an initial $1.8 million to deploy the 25-mile network, construction did not require the entire allocation. By taking advantage of existing power conduit, the community only needed to construct 80 feet of new conduit, which drastically reduced final costs. Five miles of the original network was aerial. Construction started in 1998 and was finished in 1999; over time they’ve added incrementally in order to connect customers. After engaging in an RFP process, a dark fiber lease to GST Telecom allowed them to repay the loan to the general fund within the first 13 months of operation. Not long after, GST was acquired by Time Warner Telecom (TW Telecom); both offered services only to commercial subscribers. TW Telecom still uses the infrastructure to provide business service to Pasadena customers. In addition to linking utility substations, Pasadena City fiber connects 38 municipal facilities, including City Hall, the police department, seven libraries, two fire stations, and the Rose Bowl. They’ve been able to eliminate slow bandwidth connections and leased lines and, while they know they’re saving money, they don’t know exactly how much because they’ve been saving since 1999. Pasadena public facilities offer free Wi-Fi using the fiber as backhaul and is working on an initiative now that will bring Wi-Fi to several outdoor spaces, such as city parks. The city has always retained dark fiber for their own use and to lease out directly to institutional customers. Some of the customers they serve include the ArtCenter College of Design, Cal Tech, and NASA’s Jet Propulsion Laboratory (JPL). JPL also uses sub-contractors and many of them use dark fiber from the Pasadena network for connectivity. The network brings in approximately $480,000 per year. In 2016, Pasadena started offering lit services to current and potential customers. Business customers can obtain Internet access and connections to collocation and regional peering sites. The city offers 100 Megabits per second (Mbps), 1 Gigabit per second (Gbps), and 10 Gbps connections. Lit services are still a small part of their business revenue and an area Sandoval describes as "in its infancy." While there are other providers offering commercial services in Pasadena, some businesses can’t get the capacity or lit services they need. The city is focusing on areas where businesses may need access and city fiber is nearby or where better connectivity can help enhance economic development. A developer was interested in establishing a co-working and event space in the “old Pasadena” section of downtown, which required renovating an older building. The city included high-quality connectivity in an economic development package to help attract the developer; the expansion will also help connect other buildings in the immediate area. Because the development focuses on the high-tech industry and many events tend to involve entrepreneurship, city leaders see it as a wise investment. The project is already paying off; whenever the event space is used, restaurants and other establishments nearby also benefit. Sandoval refers to Pasadena’s networks as “Fiber 1.0” - the original 25 miles and incremental, block-length expansions to add customers - and “Fiber 2.0,” which is today's network. In 2015, the city realized that their needs for both capacity and reach had grown and they began planning for significant expansion. The lease to TW Telecom, which included 75 percent of the fiber, consumed a large amount of network capacity. Pasadena began increasing capacity in the existing ring so the electric utility could make more use of the fiber network and the city could also make more use of the network. The utility now implements power distribution automation, advanced metering, and other technologies that increase efficiency but require more capacity. They also want to connect more city facilities and traffic signals that were not connected when an Intelligent Transportation System was installed by state and federal authorities years ago. Since the design of the original network used multiple interducts and the original network only required one duct, the cost of increasing the capacity is primarily labor and materials along the same path. Fiber 2.0 includes expansion to areas that, until now, didn’t have fiber connectivity. The city has already completed one of their planned buildouts off the original ring. Pasadena has general plans for what areas they intend to expand through 2020. Over the past two years, Pasadena has invested an addition $1.2 million dollars on the upgrade and expansion. They expect to continue to invest another $600,000 per year for the next three years. Residents in Pasadena are able to choose between AT&T, Spectrum, and Frontier. Occasionally, Sandoval hears from residents who want the city to offer residential services, but they don't plan on offering residential services. Pasadena feels the level of investment required and the amount of competition in the area doesn’t create a favorable environment for publicly owned Fiber-to-the-Home (FTTH). - Never underestimate the future demand for fiber connectivity. - Look out for creative opportunities, including grant possibilities. Pasadena was able to use Community Development Block Grants (CDBG) to connect buildings with a public purpose, including fire stations and libraries. They’re using CDBG to fund the Wi-Fi in the parks program. - Working with developers to ease connections to their buildings or projects can help cut costs or encourage network expansion. Pasadena encourages developers to plan a clear pathway to their main telecom room for the option of future connectivity. - Sandoval also recommends staying in touch with public works and other utilities to determine if there are opportunities for conduit use or fiber placement collaboration. Pasadena has been communicating with a local fiber provider that is installing within the area about possibly piggybacking within their trenches. Sandoval recently talked to Christopher about Pasadena in episode 265 of the Community Broadband Bits podcast. Listen to the interview to learn more. 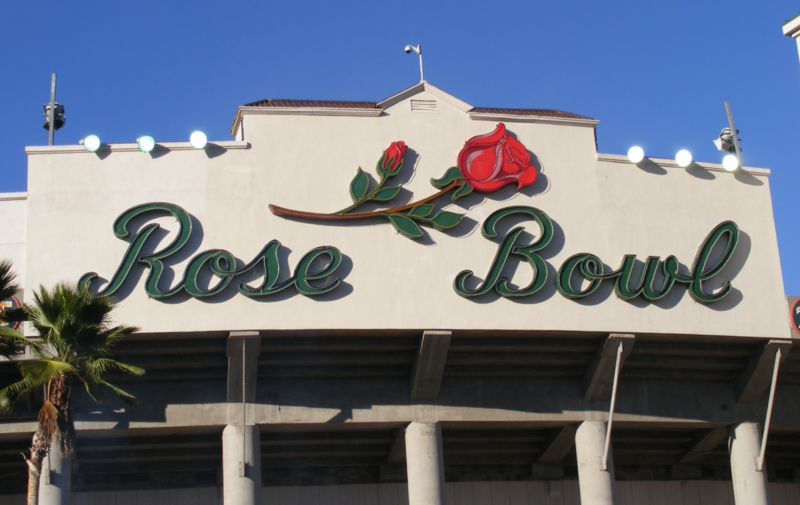 Pic of the Rose Bowl Stadium courtesy of Sparrowman980 at English Wikipedia [CC BY-SA 3.0 or GFDL], via Wikimedia Commons.